Howard Hughes Corporation (HHC) is a real estate development company that was spun-off of General Growth Properties (GGP) in 2010 as part of GGP's restructuring following bankruptcy. Howard Hughes was essentially all the "cats and dogs" assets that GGP held that didn't cleanly fit into a mall focused REIT or assets that required significant capital investment that doesn't lend itself to the REIT structure since they can only retain 10% of their taxable income. The company is structured as a C-Corp, not a REIT, doesn't host quarterly conference calls, and generally doesn't screen well making it a enigma in an industry that likes pure play real estate sector stocks. It's not as simple as taking their FFO and slapping a REIT sector multiple on the stock. The majority of their assets are long dated and fit more of a private equity like mold rather than a public company. Their primary assets are centered around five locations: Honolulu (Ward Village), Las Vegas (Summerlin), Houston (The Woodlands), New York City (South Street Seaport), and Columbia, Maryland. Sorry for the length of this post, but with the recent drop in the stock price I wanted to do a deep dive into each asset and determine if the market is unfairly punishing the company for it's exposure to the energy sensitive Houston market. Some of my Excel screenshots don't lend themselves to the limitations of Blogger, so just click on them for a better view. Howard Hughes owns Ward Village, which is a few blocks of miscellaneous retail real estate situated along the ocean just west of Waikiki Beach and Ala Moana Shopping Center (which GGP owns) in downtown Honolulu. There's currently 678,000 square feet of shopping, restaurants, etc. generating $24.1MM of net operating income, most of these are small unique shops that appeal to the local population and not the brand name stores you'd expect to see at nearby Ala Moana Shopping Center. It's a bit old and tired looking in its current form. 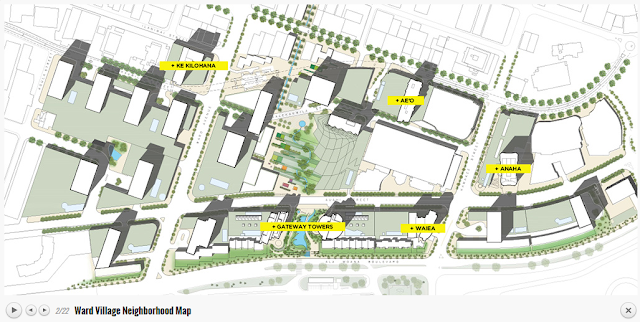 However, Ward Village is in the beginning stages of being redeveloped into a new master planned community where Howard Hughes will construct 15+ towers with a total of 4,000 condominium units and other mixed use retail/entertainment/office properties. The development will take about another decade to fully complete. Obviously Oahu's land is relatively limited, there's been limited new residential construction in recent years and Howard Hughes likes to point to the University of Hawaii Economic Research Organization's data point that "Oahu needs to produce approximately 4,000 units annually simple to meet existing demand." There are currently two towers being constructed (Waiea and Anaha) and 4 others that are in the pre-sale process. Waiea & Anaha Towers: There will be 485 units in the combined two initial towers, both condo units and townhouses on the lower/terrace levels with additional retail on the street level. About 90% of the units are under contract, buyers put a deposit down on the units which Howard Hughes is using as initial funds for construction and then tapping a $600MM construction loan for the two towers. The estimated cost for the development is $804MM or a cost per square foot of ~$980, they're selling the units for about ~$1,450 a square foot for a total expected sales of $1.2B in revenue. Waiea is expected to be done by the end of 2016 and Anaha in the first quarter of 2017. Ae'o Tower: This used to be "Ward Block M" in their previous filings, it will feature small units (average of 836 square feet) and try to appeal to the local population. Additionally the ground floor will feature a Whole Foods, the type of high quality tenant they're trying to attract to Ward Village going forward. As of October 20, 2015, 167 of the 466 units were under contract, they're expected to break ground in March and finish construction in 2018. Gateway Towers (2): These will be the priciest of the early development and no timeline has been given on when they'll be constructed. There will be 236 units and an additional 20,000 square feet of retail. Ke Kilohana Tower: As part of the development plan, Howard Hughes needs to set aside a certain number of workforce units reserved for qualified Hawai'i residents. This tower will have a total of 424 units, 375 of which are workforce housing starting in the $300,000's. Ward Village is essentially one of their master planned communities, just instead of land sales to home builders and other developers, Howard Hughes is doing the construction themselves. 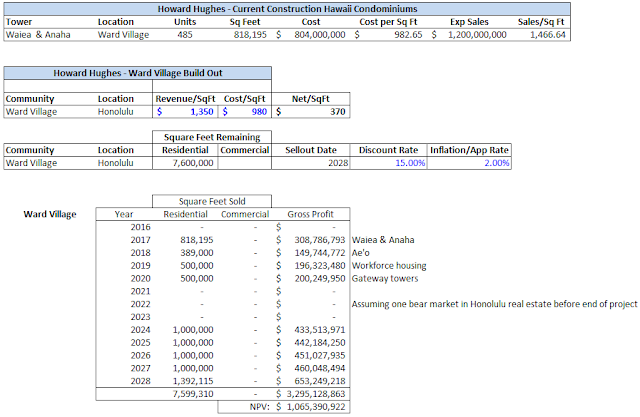 Valuing the condo build out takes on a lot of assumptions, I'm going to use the basic economics of the Waiea and Anaha towers, as far as I know them, knock them down a peg to account for the workforce housing aspect and then project out what the sales could look like in the future. For safety, I'm going to assume that after these initial towers are built, Oahu goes into a recession and nothing gets built for a few years, that's probably unlikely, but just to cover the ups and downs of long dated real estate development. Maybe it's too simplistic, but I think it's hard to argue that the condo pipeline doesn't have a net present value of at least $1 billion. 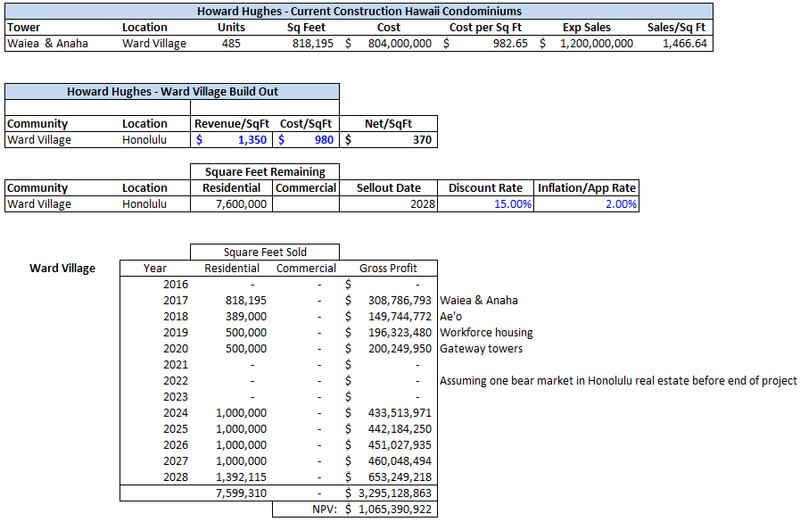 Additionally, Ward Village still is an active operating property generating over $24MM in NOI, at a 6% cap rate, that's worth roughly $413MM (minus the debt on it), but I have all the operating properties listed out further down the post. Summerlin, named after Howard Hughes' grandmother, is a large master planned community located on the western edge of Las Vegas. Howard Hughes Corporation currently owns 5,300+ acres that are entitled for further residential and commercial development in Summerlin. The housing bubble hit Las Vegas especially hard with construction coming to a standstill in the years immediately following, however the situation has improved greatly there with Summerlin land prices essentially doubling in 2015 compared to 2012. In 2014, Downtown Summerlin was constructed, the company says its the only large retail development to open in the United States since the economic downturn. General Growth Properties poured a significant amount of money into the project prior to 2008-2009, it was mothballed during the recession, and then restarted by Howard Hughes in an effort to create a central commercial/retail hub for the master planned community. The current retail/office build out is within the green arrows, the design to the east of it is 200 acres of future development opportunities including the relocation of the NY Mets triple-A baseball affiliate the Las Vegas 51s which is half owned by HHC. The approved plan entitles HHC to build 2.8 million square feet of commercial space and 4,000 residential units on the site. The first Downtown Summerlin residential project is under construction, dubbed The Constellation, which HHC entered into a JV with a developer where the company only contributed land but is a 50-50 partner in the venture, it's a popular model for them and retains some of the upside. Farther down below I group Summerlin with the other master planned communities and simply attempt to NPV the land sales moving forward. But that understates the potential value of the MPC as Howard Hughes will do a lot of the development themselves or in joint ventures, but there are too many assumptions involved to accurately project out that growth. "Both MPCs benefit from their locations north and northwest of Houston in an area that is known as the Energy Corridor." And then from the risk disclosures: "Continued lower oil prices compared to average oil prices over the past several years may have significant negative effect on the future economic growth of, and demand for our properties in certain regions where we have asset concentrations that are highly dependent on the energy sector." The Woodlands is the company's main master planned community north of Houston, it was started by fracking pioneer George Mitchell before being sold a few times and ending up in the hands of The Rouse Company, which was purchased by General Growth Properties (and spun out and now sold again). It is in the later stages of its development, most or the residential lots are sold out and Howard Hughes has been infilling dense commercial development into the Town Center and their newer development, Hughes Landing. By my count they've built 7 new office buildings with over 1.5 million square feet, over 1,000 apartment units, 900+ hotel rooms, and over 200,000 square feet of retail space since being spun-off in 2010. It's likely safe to say the pace of construction is going to slow significantly in the coming years as energy companies (Exxon, Chevron, Anadarko, Huntsman, Baker Hughes, Keiwit Energy are all major tenants in The Woodlands) pull back their growth in North American in response to oil low prices. In my model I've bumped up cap rates on all their Houston operating properties 0.5-1.0% and assuming 0 land sales are going to take place in the next two years at The Woodlands. Howard Hughes isn't a leveraged oil and gas exploration company that has no choice but to keep pumping despite low prices in order to service debt. The company has the luxury to be able to sit on their land holdings and wait for the supply/demand to stabilize, they control most of the remaining development locations in The Woodlands and don't need to rely on other market players to return to sanity (like energy). One property to keep an eye on is Three Hughes Landing, it's a 324,000 square foot class A office building that Howard Hughes built on spec without a tenant. As of their latest filing, it was scheduled to be completed in the fourth quarter of 2015 and was still without a tenant. Additionally the company owns two other master planned communities in Houston - Bridgeland which is to the northwest of the city and The Woodland Hills (f/k/a Conroe) which is north of The Woodlands. Both of these are rather new representing additional growth opportunities, but that growth is probably pushed out a few more years now that Houston has slowed to crawl. Downtown Columbia, Maryland is one of Howard Hughes' more under the radar developments, but it should start accelerating to the forefront in 2016. The company currently has over 1 million square feet in office space in Downtown Columbia (between Baltimore and Washington) which they plan to redevelop over the next several years. Fort Meade, a U.S. Army base, is located 11 miles from Columbia and is a major employer as the headquarters of the United States Cyber Command, National Security Agency, and Defense Information Systems Agency. These are in demand, high paying, secure government jobs. Their approved redevelopment plan includes up to 5,500 new multi-family units, 1.2 million square feet of retail, 4.3 million square feet of commercial office space, and 640 hotel rooms. Extrapolating their current NOI per square foot in Maryland (which need redevelopment), the full plan could add another $180MM in NOI annually. For the purposes of valuing the master planned communities I've assumed that all land will be sold to third parties at the weighted averaging selling price per acre since 2012 (hurts Summerlin for instance) and tried to simulate a couple economic cycles for the longer lived communities (Bridgeland and Summerlin). I also assumed no land sales at The Woodlands, used a discount rate of 15% for each MPC, and a 2% inflation/appreciation rate. To save you a click, I valued the MPC land at $1.4B, which should be a conservative view as they will add company owned new build construction to their pipeline over time. The company's most important, most valuable asset is the South Street Seaport in Manhattan, it was a neglected structure that was falling apart before Superstorm Sandy, and then was nearly completely destroyed by the storm in 2012. Pier 17 is currently under construction, scheduled to be completed in 2017, and will have 362,000 square feet of retail, entertainment, and restaurant space. The company has poured a lot of money into marketing the property, go here for a lot of sharp renditions of what it will look like when fully completed. Additionally, Howard Hughes has been adding to their real estate assets around the Seaport. Their current proposal to the city includes approximately 700,000 more square feet of development including the Tin Building next door to Pier 17 which would feature a seafood market and possibly a mixed use high rise building, although that's faced some push back from local residents. Some back of the envelope math on just Pier 17 shows it could generate $80MM annually in NOI, putting a 5% cap rate on that would make the property worth $1.6B. Then you could extrapolate that for the additional 700,000 square feet too if you want to be greedy. 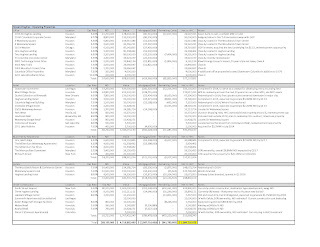 Click on the below to expand, but I pieced out each of the operating assets and those that are far enough along in construction to estimate an NOI and cap rate. 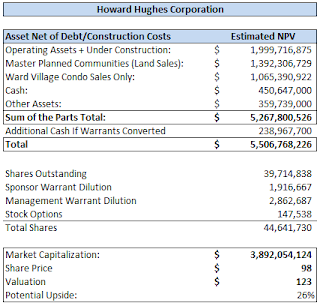 To summarize, I'm estimating NOI of $283MM (probably 2017-2018 number) based on the current activity for a combine value of $4.7B, which net of associated debt and additional construction costs is worth $2.0B to HHC equity. 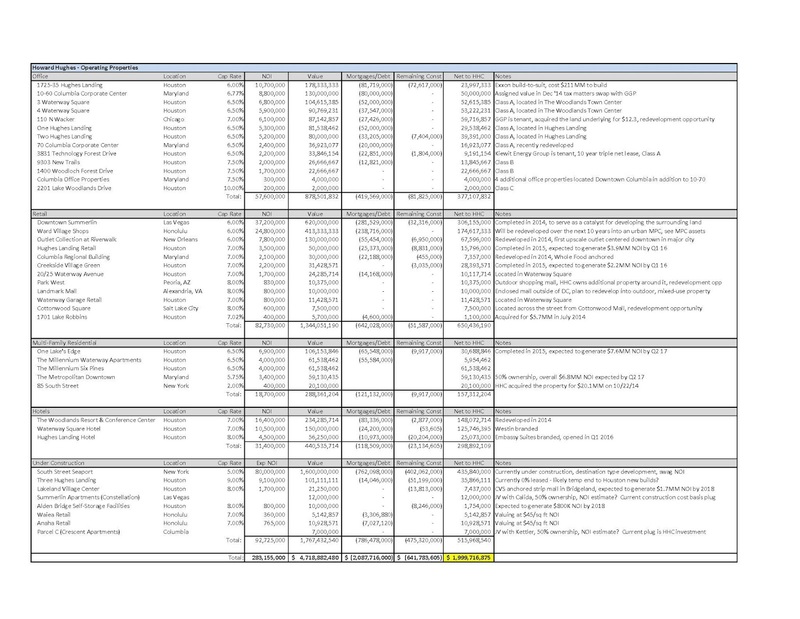 Below is a list of the company's other assets, most of these will be redeveloped one day into mixed-use assets, but their potential is too unknown, as a result I'm just marking them at cost/book. 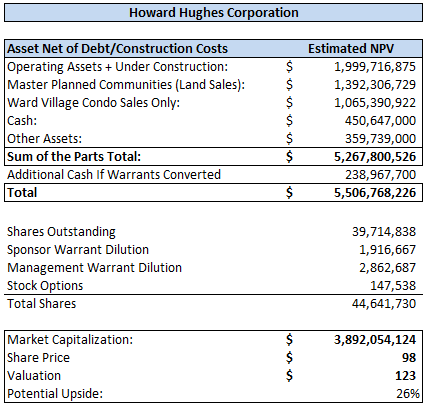 Additionally, Howard Hughes does have a small $109 million NOL tax asset that is shielding some tax liability, once this is used up I'd expect either they would convert to a REIT or spin out the operating properties into a REIT to maintain tax efficiency. Bill Ackman, of Pershing Square, is the Chairman of the Board, he's obviously controversial and Howard Hughes might get lumped into some selling pressure when the market goes after Pershing Square's holdings but Ackman has made it clear that he has the most reputationally at stake with HHC compared to his other holdings (hard to believe based on his actions at VRX and HLF but he has pseudo control here). Senior management do have warrants that they paid $19 million out of pocket for when joining the company in 2010. The strikes range from $42.23 to $54.50 and are exercisable starting in November 2016 and expire in February 2018. I'd be surprised to see management exercise early. New retail at Ward Village - doubling their square footage and significantly upgrading tenants. Columbia, MD redevelopment which should start in 2016, 13MM square feet of entitlements (office, retail, multi-family). Tin Building renovation and additional development plans at South Street Seaport beyond Pier 17. Additional unannounced HHC developed/owned commercial build out of Downtown Summer, Woodlands, Bridgeland. Any additional value above book for the miscellaneous Strategic Developments. Significant "execution risk", these are complicated developments, I'm sure there are a lot of bureaucratic hoops to jump through (especially in NYC and Honolulu), politicians and unions to please, leases to negotiate - a lot can go wrong from entitlement of a project to it being fully stabilized. These are long dated developments, each of their markets is likely to go through a cycle or two before they're fully completed. Markets can also change dramatically from when ground is broken to when construction is finished. Two of HHC's main markets are New York City and Honolulu, prices are high and "always go up" there, need to be careful of anything that "always goes up". Houston really struggles and Howard Hughes' assets and land holdings there are permanently impaired. I probably should have taken a closer look when the share price rose to $160 and noticed how much additional growth the market was pricing into the company. In one of Howard Marks' recent memos he wrote, "If you look longingly at the chart for a stock that has risen for twenty years, think about how many days there were when you would've had to talk yourself out of selling." That's kind of how I think of Howard Hughes, long term holding that's going to see a cycle or two but is quite attractively priced now.